Athena Power is a smart-sensing & data analytics company focused on critical power infrastructure modernization. 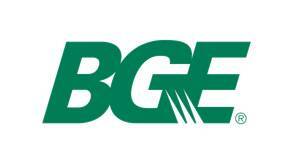 The company manufactures low-cost, high functionality solutions for companies looking to improve their reliability, resiliency, and overall monitoring capability of their assets. Athena Power is an engineering-driven company founded in Washington D.C./Baltimore and is 100% employee-owned and operated. Continuous monitoring of underground (subsurface and padmount) assets for reliability improvement has traditionally been uneconomical and challenging for widespread adoption by utilities. Additionally, significant time is spent trying to find issues with underground power failures (such as underground faults). Current methodologies in finding underground power failures include ‘Thumping’ and ‘Sectionalizing’ the grid. These procedures are crude, expensive, time intensive, and further reduce long-term reliability. Athena Power developed and currently manufacturers low-cost/high functionality sensor solutions that are customizable to continually monitor underground assets. Athena’s solution is wireless, self-powered, and uses sophisticated algorithms to locate issues (such as UG faults) while providing a continuous stream of real-time data and analytics to improve operational intelligence. Athena Power’s solution is oriented around open-architecture & standards. Our products are interoperable with various industry platforms to drive innovation and lower-costs for our customers. Our Products are Designed, Developed, Coded, and Manufactured in the USA. Our company is passionate about the problem we are solving in this industry. We take a disciplined and focused approach in developing solutions for our customers. Our solutions are creative with clean designs, elegant architecture, and tailored to address our customer’s particular needs. Charlotte, N.C. – Eight of the most promising early-stage companies nationwide in the fast-growing clean technology sector will spend three days gathering advice and, potentially, customers in Charlotte and the Research Triangle, N.C. at the kick-off of the Joules Accelerator Catalyst on May 16. The nonprofit accelerator was launched with financial backing from Duke Energy in 2013 and brings with it a track record of success developing pilot projects for corporate partners and utilities through the Catalyst program. Innovate Charlotte, a public-private partnership seeded by the City of Charlotte, the Charlotte Chamber and local foundations, became a second primary sponsor of the Joules organization this year. Athena Power will be presenting at the Urban Future Smart Grid Competition on February 22nd, 2018 in New York City. Visit Athena Power at DistribuTECH 2018, Henry B. Gonzalez Convention Center, Jan 23rd-25th, 2018 in San Antonio, TX. Please contact us to schedule a meeting at sales@athena-power.com. 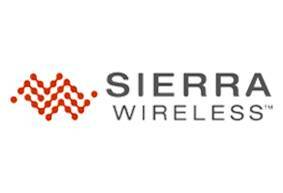 Athena Power will also be demoing the Athena UFD 1000 (Gen-2) at the SilverSpring Networks booth #2942. 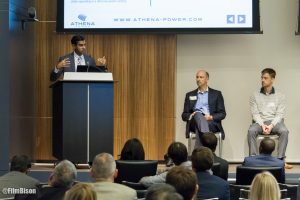 Athena Power was selected as a leading Washington, D.C. based smartgrid company to present it’s solutions and accomplishments since it’s inception to Constellation Technology Ventures and the D.C. energy community. 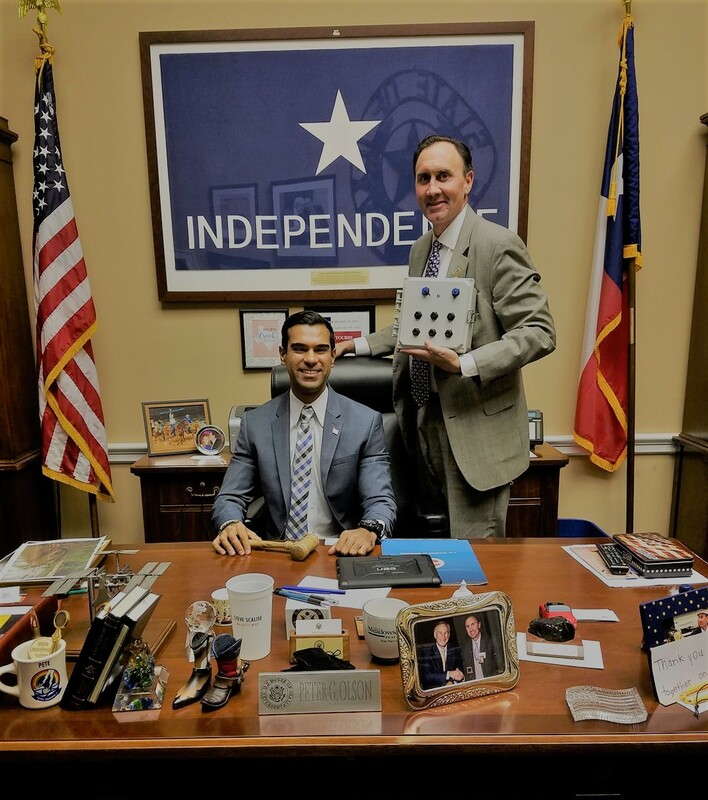 Athena Power meets Congressman Olson (22nd District of Texas) and energy staff members on Capitol Hill to introduce and promote high-tech solutions for grid modernization. 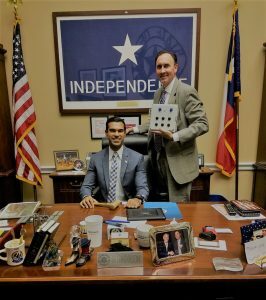 With the aftermath of Hurricane Harvey which ravaged the Houston community, Athena Power is looking to support coastal cities, such as Houston, with smart sensor technologies. Smartgrid senors can help reduce outage and patrol time, resulting in improved reliability and resiliency within the distribution network of cities. 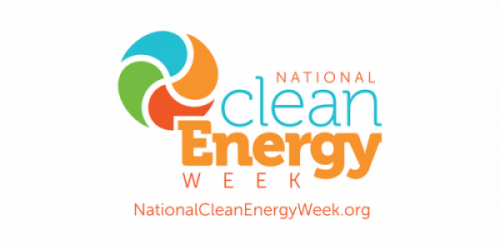 Please join Athena Power on the Hill at National Clean Energy week to learn about some of latest grid modernization efforts to improve America’s critical power infrastructure. The National Clean Energy Week’s Symposium & Demonstration Fair serves as the centerpiece of our week-long activity in Washington, D.C. Lawmakers and leaders in government, including Secretary of the Interior Ryan Zinke, Secretary of Energy Rick Perry, Senator Lindsey Graham, and Congresswoman Cathy McMorris Rodgers will address participants on public policy and engage in conversation. In partnership with the Korea Institute of Energy Research (KIER), and the Global America Business Institute (GABI), Athena Power will be leading a roundtable on “The Importance of Grid Infrastructure Modernization and Resilience: Opportunities under the Trump Administration” on Wednesday, April 19th, 2017 from noon to 1:00 p.m. Lunch will be served. The U.S. electric grid is an essential and central piece of the country’s critical infrastructure through its crucial role in distributing reliable power to residences, workplaces, public spaces, health and safety facilities, and factories throughout the nation. However, the grid was designed and built around technologies and business models that are changing. Modernizing the grid is vital for further integration of distributed energy resources and the development of more efficient wholesale markets, which will continue to lower electricity costs and fuel U.S. competitiveness. Grid modernization will also bolster reliability by making the grid more secure and resilient to cyber-attacks, severe weather events, and aging. Power outages cost the U.S. billions of dollars of economic activity annually, and investing in the country’s aging grid infrastructure will strengthen the country’s productivity and quality of life. Visit Athena Power at DistribuTECH 2017, San Diego Convention Center, Jan 31st-Feb 2nd 9th, 2017. Please contact us to schedule a meeting.